Getting older has many compensations – retirement, time to do more of what you want to do are not least amongst those. Unfortunately, we do tend to have a few more aches and pains as well, especially in our feet. However a simple foot care routine can go a long way towards making sure that you are not constantly bemoaning how much your feet hurt and allowing them to rule your life. The main problem with older feet is simply wear and tear, after all they have carried you for a long time but a little TLC goes a long way. Simple precautions such as checking your feet for injury every time you bath or shower go a long way. You should look for any small cuts, grazes, splinters or changes in the skin. If you are not flexible enough to look at the soles of your feet, put a mirror on the floor and check using that – it’s a good idea to sit down rather than try and balance on one foot! Massage a foot cream into your feet on a regular basis, as we get older our skin gets thinner and a lot less elastic and more susceptible to injury so anything that helps improve the skin will improve your feet. This will also help with circulation which means injuries heal more quickly – and flexibility is improved. Always feel in your shoes for anything rough or hard that less sensitive feet might not pick up. An untreated sore can be a real nuisance. If you do find anything a good cobbler will be able to fix it for you if you can’t feel it yourself. You should also make sure that your shoes fit properly – getting your feet measured is not just for children. Older feet sometimes need special shoes so go to a specialist shoe fitter. Ill fitting shoes can cause falls as well as blisters and sore spots. 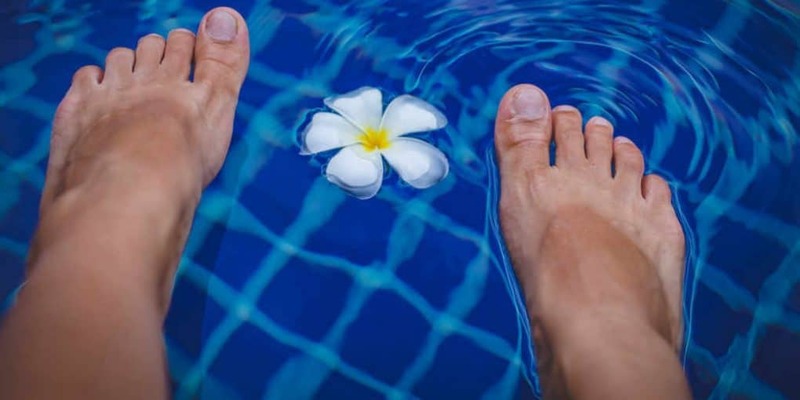 Going barefoot feels nice sometimes but as we get older you need to be more careful, Shoes provide support for fragile feet, not to mention keeping your feet out of unpleasant substances and protecting them from injury. Shoes which are designed to be worn barefoot are generally carefully made to ensure that there are no pressure points but you should still check your feet regularly. As important as your shoes are your socks, they should also fit well and not be too tight as that will crush fragile toes, watch out for seams that rub as well, walking socks should generally be worn with the seams on the outside to prevent rubbing and blisters. Keep your nails trimmed – if you have any difficulty go and see your local podiatrist who will do it for you. Good basic self-care will go a long way to keeping your feet healthy but there comes a point where professional help is advisable. If you have arthritis or osteoporosis your feet will be vulnerable and should be checked regularly. Sores, cuts, corns, and calluses are much better treated professional as you can do more harm than good if you treat them incorrectly. A regular foot examination will make sure that any damaged areas on your feet are treated before they become ulcerated, and you will be given advice and guidance on self-care.. Foot pain is considered by many to be a part of aging but it doesn’t have to be. Often as our feet get older we adjust our lifestyle to prevent foot pain but that shouldn’t be the case. If your feet hurt it could be any one of a number of causes – most of which your Podiatrist can assist with. Something as simple as a change of shoe style or an insert in your shoe can restore a much more active lifestyle., keeping you fit healthy and active for much longer.